Grenadier - Cooking Apple Tree £12.75 - Cooking Apples - Early Season Apple Trees and Fruit Trees For Sale. Buy at competitive prices with wholesale discounts. Grenadier is an early season cooking apple that cooks to a sharp creamy puree. It spurs freely producing regular heavy crops of healthy apples. It has good general disease resistance and will grow happily in the wetter climates of the south west or the colder parts of the north. 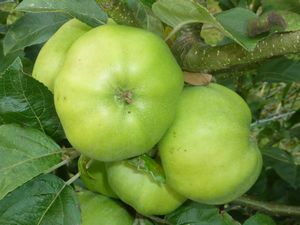 A very good apple that can be picked from August, it can also be used as a pollinator for Bramley. Grenadier was first recorded in Kent around 1860 though it is thought to have been cultivated for many years prior.